In a large skillet over medium high heat cook chicken 2-3 minutes. Add bell pepper, onions and cook another 2 minutes. 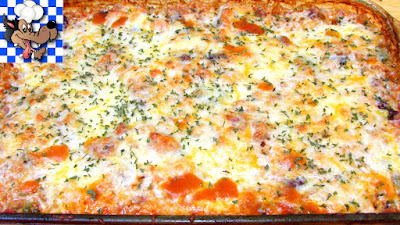 Add remaining ingredients except the cheese and mix well. Transfer to a 9x13 casserole dish and cover tightly with aluminum foil. Bake in a 375º oven for 1 hour or until all of the liquid has been absorbed. Mix in half the cheese, then top with remaining cheese and bake uncovered 5-7 minutes in a 400º oven or until golden brown and bubbly. * Cooking times and amount of water are different for white and brown rice. If using white rice add an additional cup of water and cook covered for 40-45 minutes or until all of the liquid has been absorbed. ** Add additional seasoning if you have it. Only taco seasoning was used because of the restricted budget. This recipe constituted my work lunch for an entire week and then some. That being said, I used refried beans (don't really like kidney beans) and Goya spanish rice rather than regular rice, as well as chicken thigh. I can't praise the versatility (cuz I combined it with various salsa/sauces and chips), effectiveness, and cost of this recipe enough. Absolutely delicious!